Remember how I said that I tend to OBSESS over things. It is so true. I never ever just casually like anything. It is all or nothing, always, with me. Two of my great friends had been trying to convince me for the longest time that I would love the TV show "Doctor Who." I told them I would eventually try and watch an episode but I kept putting it off. It just didn't appeal to me that much even though I was curious about their love for it. Then one night at about 3:00 or 4:00 in the morning I was channel scanning. Right as I landed on a channel, I watched a woman pull out the cutest creature I have ever seen in my whole life. It was a small, blubber-ish, white monster. I was instantly hooked into whatever it was playing on the ol' telly. A few minutes later, I realized I was watching the show I had been avoiding for so long. Now do you know what has happened? It has become my newest and latest obsession. I have been watching Doctor Who non-stop, making drawings, plushies, and other art inspired by the show, and talking about it to anybody who will listen. Not only that, the main actor who plays the Doctor, is now the new love of my life (sorry Kev). 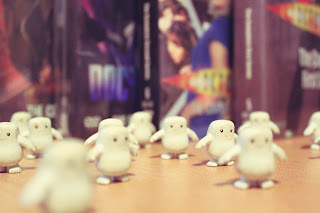 So there you have it; a picture not only encompassing my newest obsession, it also just happen that my newest purchases are Doctor Who- 5 Seasons on DVD and 21 teeny-tiny adipose alien toys (which are the creatures that got me hooked on the show, small aliens formed from fat! ).